Think you have to be an outgoing extrovert to succeed as an entrepreneur? Think again! If you’re an introvert who’s been dreaming of starting your own business, but are afraid that your quiet nature closes that door for you, this episode will reframe your thinking and get the fire going in your belly. Just because your strengths may not naturally include networking, presenting, glad-handing, or sales, that does not mean you can’t be a hugely successful entrepreneur. 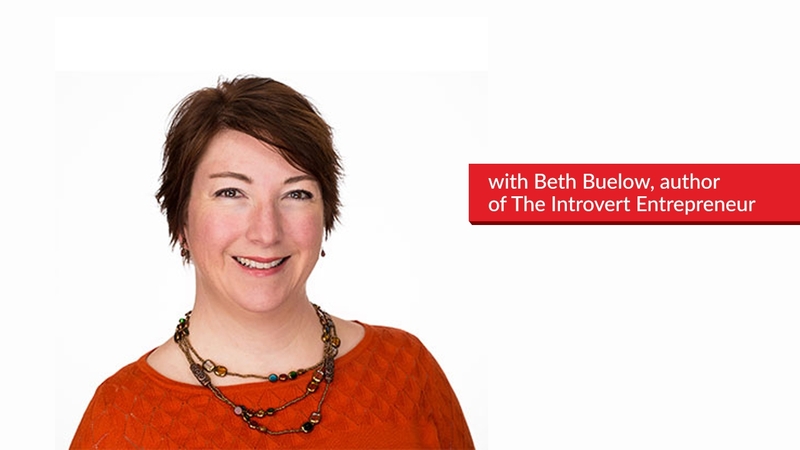 In today’s episode, I talk with Beth Buelow, author of The Introvert Entrepreneur, about the limiting stories we tell ourselves, how to overcome them, and how to identify and leverage the natural strengths that propel us down the path to entrepreneurial success. 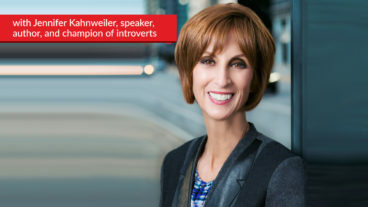 Despite the significant strides made in recent years about recognizing the gifts and power of introverts, the stubborn stereotype remains: the one that say that truly impactful entrepreneurs must be extroverts. After all, starting a business from the ground up entails a whole lot of typically extroverted activities – meeting new people, reaching out to old and new contacts, attending events, pitching to investors, selling to customers, leading meetings, and on and on. I’d point out that all of those skills can be learned and mastered by introverts; in fact, introverts can be even better at them than extroverts, with a system and a process. But as Beth points out, think about all the other elements of successful entrepreneurship – the ones that may be a bit more hidden, but every bit as important. These include preparation, research, careful listening, understanding your prospects and customers, analytical thinking, creativity, focus, writing skills, and so much more. These entrepreneurial qualities may not get as much recognition as those that are more public-facing, but can you imagine a successful business without them? The only thing that holds introverts back from entrepreneurial success is the stories we may tell ourselves. The simple secret is not to try to change who you are; it’s the opposite. Embrace your introversion, be true to yourself, and harness your amazing natural skills. By now, you may be saying to yourself, “Ok, I’m an introvert, I embrace it, and I’m excited to use my strengths in entrepreneurship; but I still have to do the extroverted activities too, right? How can I get good at those?” I firmly believe that you can not only acquire these skills, but even enjoy them. To start, Beth recommends thinking of these activities in terms of energy rather than time. For example, do you get worked up at the thought of making several calls in a row? For Beth, she knows that the best way to manage phone calls is to batch them and do them all at once, rather than “getting one over with” and working on a different task before moving on to the next call. By doing all the calls at once, Beth is able to build momentum and get into the groove, instead of splitting them up throughout the day and being forced to summon that energy over and over from scratch. It’s helpful to apply this “energy” idea to all of your daily business activities; strike a balance between the tasks that stress you out and the ones you enjoy. Terrified about hosting that webinar? Consider spending some time beforehand on writing a blog post about the webinar topic, or working on your registration email campaign – tasks that are related to the webinar, and will help you prepare, but that don’t fill you with dread. Then gather your energy and go for it, knowing it won’t last forever and that you can soon return to the tasks you prefer. Think of it this way: When you take those steps outside your comfort zone, you can then reward yourself by getting safely back in it, until you next venture out. That is the key to growth – taking risks, working through fear, and then recharging your batteries so you’re ready to do it again. Matt: Hello everyone, and welcome back to The Introvert’s Edge. And today I’m ecstatic to bring a real introvert expert to the show. Beth Buelow is the founder of The Introvert Entrepreneur, and the author of The Introvert Entrepreneur book and podcast. So I’m ecstatic to bring her on. To bring a little bit more theory, and a little bit more structure and strategy to the podcast than what we’ve been providing so far. So Beth, I’m so excited to have you on. Thank you for joining us. Beth: Thanks Matthew, I am delighted to be here. Matt: So I’d love to hear a little bit more about your story. I mean, I know my story about how I ended up becoming an author for introversion – but I’m really interested in hearing yours, and how you got to where you are now. Beth: Well, as a lot of entrepreneurs’ stories go – it was a long and winding and twisted road, that might not seem like it came to its obvious conclusion. But yeah, I started out getting training as a musician. So my ambition was to be a professional clarinetist. And it was in the course of doing that, and actually being a musician – and I should say, a lot of performing artists and people that you see on the stage, happen to be introverts. There’s something about being able to lose yourself in a role – and in an identity, that is very appealing to us. So you would think it’s contrary, but it’s actually quite synergistic in lots of ways. So that’s what I envisioned for myself to start out with. And eventually that dream shifted to being a little bit more behind the scenes, and doing arts administration. Which then morphed to non-profit management, which then morphed to doing consulting and coaching types of work. So in my – when I look at my trajectory, it makes sense to me. But somebody might say – you started out as a musician, and now you’re a coach – how does that work? But there are common threads throughout that I’ve noticed. And one of those is a love of asking people really good questions. And creating safety for people. Being present, being a good listener (also another introvert trait). And having a pretty strong independent streak, that has served me throughout all of that time – and I think has finally led me down that entrepreneurial path. And I – finally I decided to focus on introverts after I’d been coaching for maybe about a year or so. And you’ve probably heard from your other guests, and will hear from guests in the future, how important it is to identify your target market. Your niche, and who you’re going to serve. And I think that’s especially true for introverts. ‘Cause it helps us to focus our energy, so that we’re not spreading ourselves out too far. And it was truly one of those light bulb above the head, “Aha” moments, when I realized that I was attracting introverts to my coaching business. And I put the two together, and said, “Oh, wait a minute, maybe that’s my ideal client? Maybe that’s what I – where I make my mark in the world?” And so that’s – it was kind of an organic process that– Just listening to who came, and paying attention to that. So that’s – that’s how I came on that path to finding the introvert space. Matt: And almost a decade doing it now, right? Beth: Yes. Yeah, I founded The Introvert Entrepreneur in 2010. So going on a little over seven years. And coaching for almost a decade total. So it’s hard to believe. Time flies when you’re having fun. Matt: I’m so glad that you did. And I think that the entrepreneurial space for introverts is something that needs to be talked about a lot. I mean we’ve had so many great guests on The Introvert’s Edge Podcast. And what’s been interesting is – so many of them think that they’re the only one. I mean I’ve had the same thing myself. I’ve – since I started this podcast, I’ve been telling my friends about it. I got Ivan Misner, the founder of BNI to be on the show. And originally he was just – he endorsed the book. And I wanted to invite him to be on the show. But I said, “I can’t invite this–” I mean he had such an impact on my mother. My mother was a business coach, and the only reason she got clients was because of BNI. So I just – I really wanted to have him on the show. Beth: Yeah, right. Right, I’ve seen that too. And I think that’s– One of the major things for us as introverts, we seem to project that everybody that we see that’s successful – tends to be an extroverted person, and it’s easy for them. And it’s in our own heads. Do you find that that happens with a lot of entrepreneurs? Beth: We have that stereotype. We have that expectation that if somebody is successful, that they’re an extrovert. And especially in the entrepreneurial field. Because when you think of entrepreneurs, what do you think of? Sales, networking, putting yourself out there, relentless self-promotion. And those are all things that perhaps – those are all ingredients to becoming a successful entrepreneur. What is actually the consistent thing between all of those successful people, is not that they’re extroverts, or even that they’re introverts. It’s that they have owned who they are. They’re true to themselves. They have figured out what’s their own secret sauce or magic formula that allows them to offer their gifts, offer their products, their services, in a way that is authentic to them. And so when you see the introvert entrepreneur who is successful, they can appear to be much more outgoing and social and friendly and gregarious, because they’re excited and passionate about what they’re doing. It’s about being of service to other people. They are looking and craving that connection still. Because even if we’re introverts, we still need people, right? It doesn’t mean that we want to hide in a cave somewhere. We want to be of service to people. And so what you’re seeing is the enthusiasm that comes from saying, “This is who I am, this is what I have to offer. I believe it. I feel I have–” And one of the things I try to remember is like – I have a responsibility to bring out what I have to offer for other people. Because I have something that can be helpful to them. 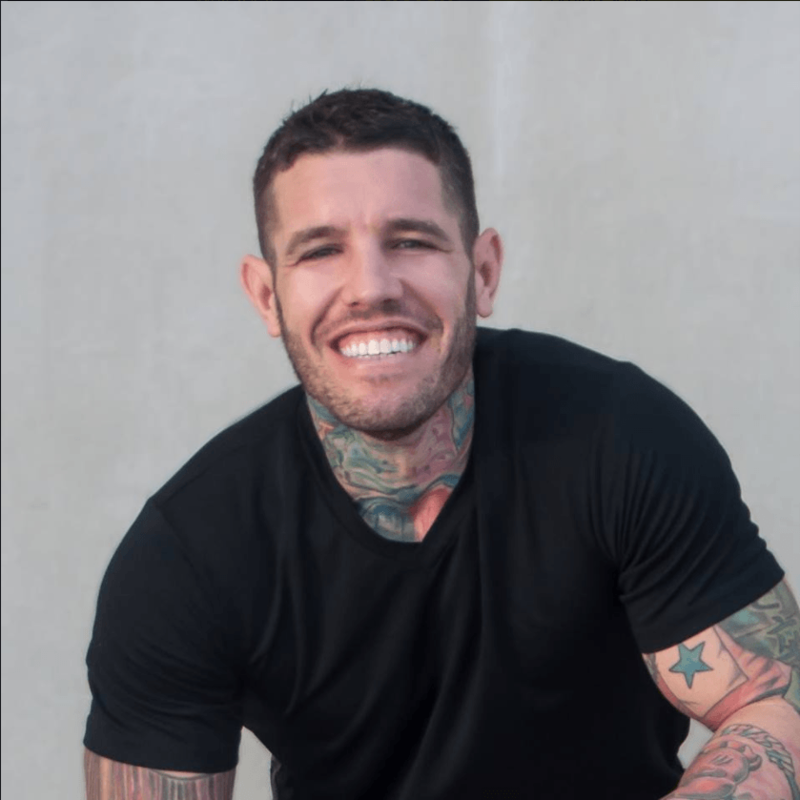 And in the process of doing that, if I’m feeding myself, and if I am honoring who I am as an introvert by getting plenty of downtime, plenty of alone time – then that gives me the energy to be able to show up and project that kind of enthusiasm, that enables me to create something that is a successful business. Matt: Well, I batch them. And the reason why I batch them is because the same thing happens. Last night, I had this thought that, “I’m not prepared, and there’s no amount of preparation that’s going to get me ready. I’m not sure whether or not I’m going to be able to provide value.” And I get anxious about having these types of interviews. So I batch them, so I don’t have to deal with that for five days straight. So I do back-to-back interviews. I think as an introvert, we think inwards a lot. And a lot of it’s negative self-talk. And we have to learn how to deal with that. But on the flip side, we’ve also got to work out what works for us. Now I know that you spend a lot of time working with introverts, and helping them overcome these barriers. So what strategies would you give me and other people that are going through some of these limiting beliefs, that are getting in the way of being successful in business and in life? Beth: What you just cited is a great example of honoring something that you’ve learned about yourself. Somebody else might say, “Oh, I would never do five in one day, or nine in one day. You’ve got to break that up.” And well, that might be true for them, but that’s not true for you. And when you described that, it reminded me of what I learned about making phone calls. I do best if I have to make like five phone calls in a row. And I don’t even have time to think about it. I just pick up the– I just – not even pick up the phone, that’s so old-fashioned, right? I click “dial” on my Skype – before I have time to talk myself out of it. And if I batch those sorts of activities, then I get some energy and momentum going. And like you said, you’re not nickel and dime-ing your energy away. You’re not nicking away. And I’ve found that for myself, and I’ve found that with clients that I’ve worked with. When they’re thinking even of – of like how they schedule their time. One of the ways that I – that’s been helpful for me and clients – is to look at your calendar. Look at your activities in terms of energy, as opposed to time. So think about how – like for me, one block of – one hour of time might be two hours of energy. So I have to think about – okay, if I know that – if one hour of expenditure really is two hours of energy, what does that mean for how I block my time, schedule my clients, schedule interviews, any other activities that I might be doing – how do I balance those external activities, such as talking to you, with the more internal activities, like writing a blog post, or posting on social media, or doing some other visibility or marketing types of activities. Take those baby steps. Write the few blog posts. Get yourself some energy and some momentum up. Get your – kind of the low hanging fruit, so you get some successes. And then you start to stretch your comfort zone, and you start to add activities that bring you closer to that place that might be just outside of your comfort zone. And as you do that, what you find is that your comfort zone starts getting bigger and bigger. Like we don’t want it to stay this size forever, right? We want it to expand. Ideally – I don’t want to spend all of my days on the edge, racked with anxiety. Yes, I want a little bit of nervous energy, and I want to be stretching myself. But I also want to feel like I’m successful, and having some of those activities that feel like they’re in my wheelhouse, so to speak. So that’s another thing that I think is important for introverts. To look at your comfort zone as both a launching pad – it’s the place where you start out with those baby steps. And it’s a soft landing space that you might retreat and go back to, in order to recharge and kind of get your grounding again before you go out and you make those leaps and you stretch. Matt: I totally agree with that. And I think one of the other things around introversion is – especially as entrepreneurs, we set ourselves all these different barriers. I mean, “I can’t public speak. I can’t network. And I can’t sell, and I shouldn’t have to.” What are some of the other–? I mean, you’ve worked with so many introverted entrepreneurs now. Twofold question. I want you to make sure that every introvert knows that they’re not alone in this. And also – just go through some of the other examples of these barriers that just aren’t real, that a lot of introverts set themselves. Beth: You’re not alone. So I’ll just say that. Absolutely. It’s really funny when I tell people I work with introverts. ‘Cause they’re like, “Where do you find them?” Because they assume that we’re just all off, scattered in the wind. And what I have found – and probably you have found, Matthew – is that when you put a stake in the ground and you say, “Hey introverts, let’s talk,” they come together. And especially over social media. So through that community, I think people have learned – not just me saying, “You’re not alone.” They hear stories from each other that they know that they’re not alone. And when it comes to those stories we tell ourselves – oh, there are so many, aren’t there? Especially around, “I’m not a networker, I’m not good at sales. I don’t necessarily play well in the sandbox with others.” Not because we’re bad people, or that we’re anti-social or don’t like them. It’s simply not our default. It’s not where we go to first. Like I could be working on a project, and – my podcast for instance. And by – once I hired that person for my podcast – now I have somebody who does the editing of the podcast, as well as show notes. Which I was trying to do myself, too. So now I have a small team of three people, and together we make the podcast happen. And I spend more of my time now preparing for interviews, and doing that part that I really love and I’m good at. And I let somebody else handle the other pieces that they are good at. And that brings them satisfaction. And that brings me satisfaction. So that’s one of those stories that we tell us, that can really slow us down. That it’s– To recognize when it’s the right moment to reach out, and bring people onto your team – can be a real pivot point for you and your business. Matt: That’s great advice, Beth. And thank you for sharing that. I think that a lot of entrepreneurs that are introverted – they do, they set themselves excuses, and find ways – they try and find ways through the maze, as opposed to just finding a way to get rid of the maze. 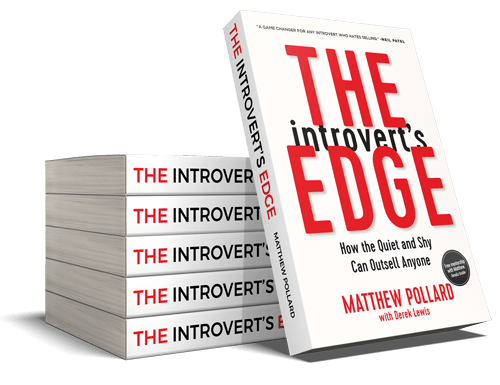 Matt: What are some of the questions that you would suggest that some of these introverts ask themselves, to help them overcome some of these limiting beliefs – or the hurdles that they’ve self-imposed? Beth: Well in my book, I talk about FUD’s. F-U-D’s. Fears, uncertainties and doubts. I did not make up that term. That comes from back in the 80s during kind of the personal computing and tech boom, when there was a marketing professional at IBM who said, “We need to instill fear, uncertainty and doubt in our customers – so that they don’t switch.” It’s kind of stay with the devil you know. And even – let me back up. Even before I ask, “What are my choices about that?” And here I’m borrowing from someone else again, a little piece – Simon Sinek, “Start with why.” “Why is it important that I network? Why is that a crucial activity for me?” Because if you don’t have buy in – that it’s something that you should even decide you have any choices about, or that you want to work on – you have to understand like, why is it important? And if you can say, “Well actually, it’s not important.” Then you can kind of move on and say, “Okay, so I’m – if I’m thinking, ‘I’m not good at networking, I have to network,’ is it important? Why would I do it? Well, it’s not important.” Then what you’re noticing is that you’ve absorbed the should’s that happen. You should be doing this. You should be doing that. You should be out at the happy hour networking events, etc. So you’ve established that for yourself. And then you can say, “Okay, so what are my choices about how do I approach the networking?” And you put them all out there. And I always say – even include the choices that you might not make. So for me, I’m guessing for you – but I don’t know, because in the spirit of no assumptions – happy hour networking, not my thing. You walk into a crowded bar, there’s lots of people talking. There’s – juggling food, and it’s noisy, and there’s stuff going on that’s not – doesn’t have anything to do with the event you’re there for. Not my happy place. But I still have to put that – I still put that on there, because I’m saying – I’m consciously choosing not to do that. But then I say, “Well what are other types of networking that I do enjoy? Well, I enjoy going to conferences. I enjoy going to workshops. Book signings. Webinars. Other entrepreneur events. I appreciate networking with my professional peers, like other coaches.” So then I’ve got this sort of menu, and I can say, “This works for me, this doesn’t work for me.” And I’ve been very conscious about it, so that I kind of eliminate those, “Well, I should want to go to this.” Well, no – I – that’s not the most effective and efficient use of my time. So that’s not going to be one of my choices. I can go onto this website, I can look for networking events. And say, “Okay, I’m going to commit to going to one event a week.” Or even one event a month. It’s going to be different for everybody. It’s going to be different, depending on what your peers do, what the expectations are, what you feel comfortable with, what your needs are. And then commit to it. And ask yourself also like, “What is my intention with doing this? What would I consider to be a successful outcome of making this choice? What’s going to be a successful outcome if I continue to make this choice for a certain period of time?” So perhaps I have a six-month networking plan? And at the end of that six months, what would have shown me that it’s worth my time? What will success look like? Which often is a seed question, I would say for anything – whether it’s networking or having a prospecting plan or a sales pipeline, or a new product or a new service. Always start out by asking like, “What will success look like?” And making sure that that definition of success is true for you. Not based on metrics that somebody else might want, but something that’s true for you. Matt: Beth, I think that’s incredibly valuable. Because so many people say they can’t do things, when in fact it’s that they don’t like doing something. Beth: It’s a big difference. Matt: And I think that – and Dorie Clark spoke about this as well. That she realized that she didn’t like it. So she found a way that she would like it. And I think you’ve identified the exact same thing. It’s, “I need to do this, and here’s what success looks like. And if I’m going to do it, here are the ways that I’m happy to do it, where I may enjoy it. Or maybe I’m not going to enjoy it, but I know that the pain’s worth the gain if I see these results?” And I think that’s really powerful. Beth: And I’d like to add – in addition to recognizing I like it or I– “It’s not that I can’t do it, it’s that I don’t like it.” There’s also – I think introverts can make up a story about extroverts. Like they’re really good at networking, they love networking, they love getting out there, they love sales. We can make up those stories and assumptions about them. When in reality, many of them – they have to work at it too. It does not always come naturally or easily. They’re not always up for a big conversation or a big group of people. They have to work up their energy as well. So if we can recognize that some of those activities are – yes – some people might have a natural disposition to doing them. But for most of us, for many of us – it’s a skill. It’s not necessarily an inborn, natural gift. It’s a skill that we have to cultivate over time. And that we can become better at it. Matt: I think that’s really valuable. I mean, I’m just thinking about some of the extroverts that I’ve worked with in sales and networking. And when we have to go to a networking event, we’re screaming sometimes inside our head – ’cause we don’t want to go. I’ve seen extroverts that are at networking events screaming to themselves inside their head, because they’re trying to focus on listening. And they can’t stop themselves from jumping to thinking of what to say next. They keep saying, “Don’t interrupt, don’t– But it’s so boring. Don’t interrupt, don’t interrupt.” And they’re going through different struggles, but the same type of problem that they’re limiting themselves in a lot of ways. And I think a lot of times we’ll put up– We’ll almost say, “Well we can’t do it, because we’re introverted.” Extroverts can’t do things as well. And it’s really – introverts need to learn how to do these skills differently, that work for them. And extroverts need to learn how to do skills differently, that work for them as well. And everybody has failures, and disadvantages. And everyone has success factors, or what we’re calling “edges,” and also disadvantages. So I think that it’s really important to understand that nobody comes from a point of being perfect. So we’re going to pick this up in the next session, and I’m looking forward to getting some – some real tangible strategies on how introverts can overcome so many other hurdles that we set ourselves. But thank you again for joining me on this session. Matt: And for everyone that’s with us – watching along, or listening along today – thank you so much for joining us. If you’re enjoying this episode, then make sure you catch the second half at theintrovertsedge.com/beth. And also, make sure if you’re enjoying this – to help other introverts discover this podcast, and this amazing content – or, I hope you think it’s amazing. Please subscribe to the podcast, and also please post a review – which will help us go higher and higher in the charts, to make sure that more people like you can access this information, and become more successful in both business and in life. But I’ll see you in the next episode. Thanks again. Cheers.